The World Series is not something I usually watch, because my favorite team is usually not in it. I am a Texas Rangers fan, and this year was their shining moment in the sun. That is, until game 6, when the sun shattered into a billion pieces while I watched the game slip out of their hands and into the Cardinal’s. During game 6 I found myself reflecting (during commercials) on exactly why I cared so much whether they won or lost. I have to admit, it took awhile to figure it out. If you asked my parents they would tell you I’m not a sports fan. I never played any sport as a kid, and in general avoided anything sports related on TV. I tried to play on a co-ed softball team for one short misguided summer while I was in college. I’m sure the other teams loved me. I came home covered in bruises from trying to blocks balls with my body instead of catching them with my hands. It’s impossible to throw someone out when you have let the ball bounce off your body like a human trampoline. The typical score of those games was 32-0. Guess which side I was on. Then my future husband stepped into the picture. Sports are a lifelong passion for him—Can you say opposites attract? He’s a mathematical wizard when it comes to baseball in particular. If you’ve seen the movie Moneyball…he is the statistical guy they bring in to save the team. He is, dare I say, the Rainman of baseball. When he watches a game he says everything the commentators say…before they say it. He truly missed his calling, but that’s beside the point. The point is…really I did have one…the point is that his love for all things sports couldn’t help but leak onto me after so many years of dating and marriage. My question happened to land during one of those rare moments of silence in a crowd, and my voice carried out to the field where the players walked dejectedly back to the dugout. One of the guys looked straight at me, then hung his head. His shoulders sagged as he went down into the dugout. The other player shot me a look full of venom and hit the top of the dugout on his way in. My sweetie gave me a squeeze and said “yes, see…that’s a double play.” The old man next to us burst out laughing, as did several rows around us. He then had to explain double-play to me, in detail. I’m sure the players in the dugout heard every word. I feel bad, they seemed so sad that day. Would it help if I said I thought they were really cute? Then came the tickets to a Ranger game that I got him for his birthday. Followed by another game. Followed by another. Then came the season tickets. We shared them with a group of people but we still ended up with 13 games a year. Our team wasn’t good at all, but we had a blast going to the games. It’s incredibly relaxing to sit in a ballpark on a sunny afternoon (in the spring, this is before the unholy heat of Texas summer) and listen to the crack! as the ball hits the bat, smell the hot dogs and popcorn and spilled beer, and hear the roar of the crowd. As we made sports part of our married life I created memories not only with my husband, but with my team. 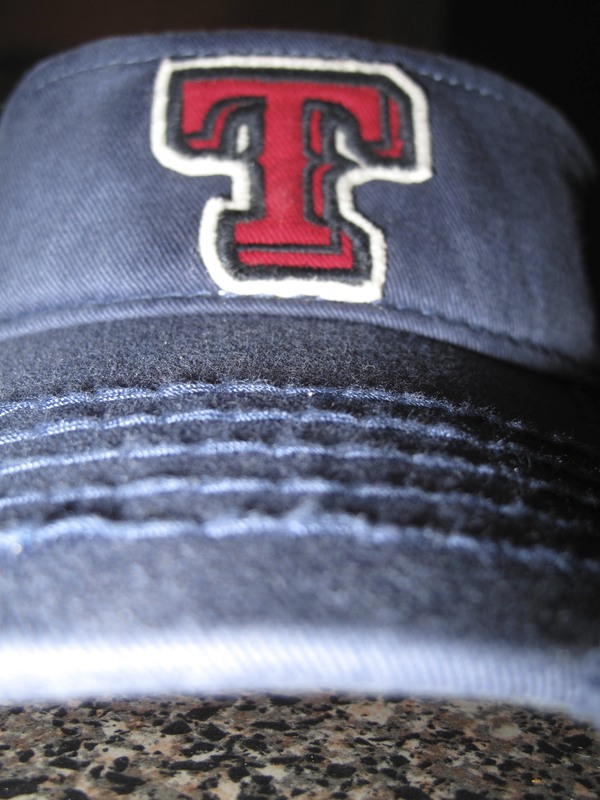 My Texas Rangers. Which brings me to game 6 of the 2011 World Series. The torturous roller coaster of a ride that they called a game. We scored…they scored. We made an error, so did they. It went into extra innings. Extra torture. Extra heartache as the game slipped away. And I said to my husband “I hate that I care so much.” I never understood why my husband would start yelling and cursing, or pacing, or wringing his hat or throwing things in frustration until Game 6. That night I was the one stomping around (I’m sorry, neighbors below us), screaming, pounding my fists on the table, throwing things (pillows, I’m not into breaking things), and in general wringing my hands over the tragedy that ensued as we lost that game. Yes, WE. I am a Ranger fan, and I felt every single high and low of that game with them. And now, I see. I see why he’d get so worked up. I wanted so badly for them to win. I stood by them through the lean years when we couldn’t win anything. I watched new players join the team, their eyes full of youthful exuberance and hope. I watched that shiny new ballpark be built. I had seats there…MY seats. They deserve to win, they’ve worked hard for it. But that night…so did the Cardinals. Darn them. I won’t even go into the heartbreak that was Game 7. It still hurts too much. Most likely I will pout about it until spring, when the new season starts and we have a fresh chance. 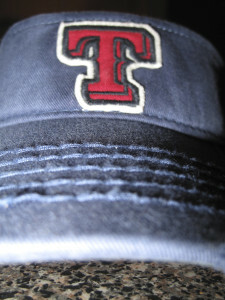 Until then, thanks for the great season Texas Rangers!